This topic is about getting the horriblly awful soldat default controls changed to something better, so that new soldat players aren't even more lost and confused than they are anyway. and all of these key assignations are bad. Soldat is a game which requires a lot of skill and fast paced action, that means you can't just press WASD and shoot like you do in CS:GO and other games. You will have to press several of different keys in a really short interval to be a good player. Certain things are not possible with the current default setup. If you claim they are possible, you must've invented a really weird way of using your keyboard or the way you do it slows you down a lot. The image above shows which keys are 100% ergonomic (on common keyboards) and you can assign all 5 fingers to them without ever the need to re arrange them. You can just leave them placed on the keys while playing (which you can't on the default setup) C and CTRL aren't ergonomic but are the closest keys to use for any other action such as prone. That's a change which was comes with scientific proof and it literally takes 30 seconds to add it to the game. 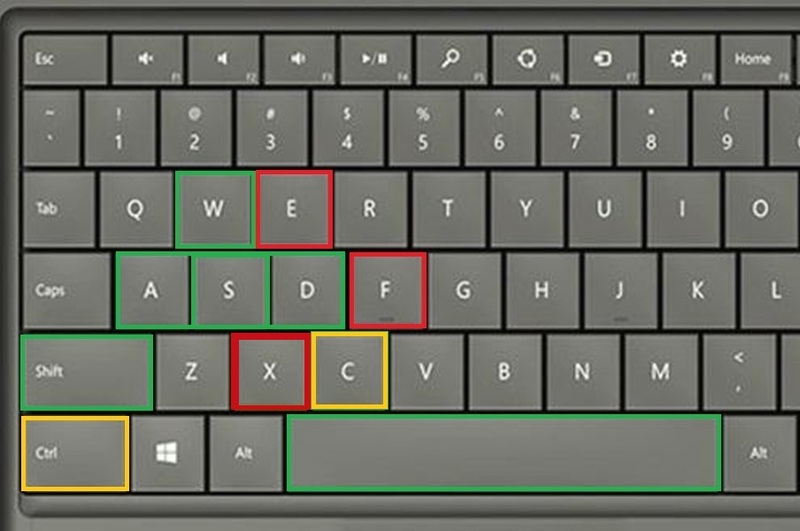 The image above shows which keys are 100% ergonomic (on common keyboards) and you can assign all 5 fingers to them without ever the need to re arrange them. Yes the rule of the five fingers. Shift and space bar should be used in the default keybindings scheme. Fully agreed, default controls are awful and should be changed. That's not even up for debate IMO, you've explained why this changed is needed well. We just need to agree on the new default bindings. Personally, I have prone on Shift and "throw weapon" on Spacebar and it works wonderfully, and everything else bound to mouse (except WASD and flag throw). * Throw weapon - spacebar. * Throw grenade - middle mouse button. I don't think binding more actions than jet and fire is a to the mouse is a good idea. changing weapon with scroll is certainly a bad idea as 1) you can only wear 2 weapons anyway 2) It will slow things down a lot + Q is certainly a known weapon to change the weapon in 95+% games. Same goes for using the middle click. That's certainly a horrible key especially for nade throws / knife throws as these actions require instinctive feeling which a middle click does not provide. Also, good knifers / nade throwers will adjust their aim while charging the throw and keeping middle mouse button pressed + moving the mouse is not ergonomic at all. You'll also have to comepletely re-arrange your hand to the mouse 2 times; 1) when using the middle mouse click 2) when going back to the default position. This will cause losing your aim momentum a lot. I' have binded mouse 4 to ingame voice and mouse 5 to voice chat (ts3, mumble). Whenever I'm using those in FPS such as CS:GO i'm losing a bit control over my mouse. On a competitive level things like that will make you lose. Its for sure not the perfect setup while nadecancel is not working well. Also I would set the mouse sensetivity to 30%-50% as default for newcommers. I think newcommers could better aim with that rather than get sticked to 100% sensitivity. Shift/ctrl and space should definitely be used, they are used for pretty much any other game so would definitely be fine and make more sense. I would say the most important change I made was the nade key, "E" is just a ridiculously bad default I feel having the key assigned to "E" just causes you to suicide more on your nade because your movement is hindered when you throw the nade. But I also completely disagree about the middle mouse button thoughts darDar, I can't say if it is more ergonomic or not but it definitely improves knife/nade aim once you get used to it. Many many top players have used middle mouse for throw for long time, and whenever I have faced someone who never misses nades they always seem to use middlemouse for nade. Maybe its hard for me to give an opinion on this one though because at this stage it just feels like second nature. I doubt we can achieve perfect ergonomy while also trying to keep it compatible with most of the hardware, so we'll have to make compromises. Middle mouse button is not ideal but it's good enough, definitely a far better alternative than current keys. Some other games also use it for grenades. Personally, I never found it to be a big issue having grenades on MMB. I think it should definitely be put to use. Alternatively, we could bind "Throw Grenade" to Alt and "Throw Weapon" to Spacebar - these buttons are right beside each other and can be easily pressed with your thumb; Since there's never a need to press them both at once - it should remain ergonomic. Though it might slow down your reaction time if, for example, you need to throw a knife but your thumb is on the grenade key. So again, not ideal. I'm fine with weapon switch staying on Q, since it's something you just need to quickly tap once, which generally isn't a problem. That's not a good idea imo. The word 'default' in 'default controls' already implies that settings are default, which for mouse sensitivty is ofc. 1.0 (100%). Also, forcing players to use a heavily slower mouse than they are used to from their windows application is a bad idea. I was talking about throwing a knife/weapon and grenade at the same time. You can't do both, so there's no need to set up the controls around allowing it. I don't see how pressing 3 mouse buttons wouldn't work. It works just fine for me and I never had a problem with it. Perhaps you're just not used to that setup? I can see it being more difficult with semi-autos though, because you essentially have to time two different things with one hand. I agree about MMB + mousewheel, I actually recall running into this problem myself when I had reload bound to mouse wheel and kept accidentally triggering it. We can leave either MMB or Wheel not bound to anything, but it's a waste to not use either of them. So what do you suggest? That's not a good idea imo. The word 'default' in 'default controls' already implies that settings are default, which for mouse sensitivty is ofc. 1.0 (100%). So what is 100%? Thats somehow sounds ironic depends to this topic which is to talk about change "default controlls" to "ergonomic controlls"
Also, forcing players to use a heavily slower mouse than they are used to from their windows application is a bad idea. Why would I shoot my gun jet and throw my gun at the same time darDar? I have played Soldat for so long that I remember having to update to 1.0. In all these years I have never used the default controls. With Soldat being the first & only PC game I have ever played this surely says something about the accessibility of the default controls to newcomers. Using E for nade feels horrible to use (for me at least), and in my opinion should be remapped somewhere that is more intuitive. Many new players struggle to even find where to set their screen name so expecting them to figure out how to remap controls for practicality is an oversight. Especially when grenade throw is such an integral aspect of the game. E has always been unassigned for me. All the other functional keys feel pretty fluent (to me) with the exception of F11/F12. Having to quickly mash one of those keys in order get rid of that bloody map/kick vote pop up is very annoying & still often results in my death. This works great for me. I am able to perform all movements with ease & speed. The only downside with this layout is that I sometimes accidentally throw flag when jumping immediately after crouch/roll. I don't think throwing nade on mmb is the best choice as you can fire while throwing nades while flying and lmb + mmb + rmb is not a good combo. Also lctrl and lshift should be actions you don't do at the same time. This shouldn't be an issue, since pasting text is only needed when you are typing, in which case none of the other keybinds work either. Off-topic-ish, but slightly related: Taunts shouldn't trigger when using Alt Gr, since that makes it impossible to type certain symbols when the keys you use for those symbols have taunts assigned. When you're typing, and you press a taunt, the taunt populates the speech bar without getting sent, thereby allowing you to edit your taunt before saying it. I'd constrain that only to a situation when the text field is empty, although you're right, it'd still produce a conflict. Never mind then. I'd say this is the "no, no , no , no , no" type of thing. So with the new changes to default controls, I'd like to revive the topic and complain about the new default controls. The new default controls make it so if you need to prone while moving right - you have to press D and F keys with one finger. That's far from ergonomic. Prone is something you do very often and plays a big part in the movement system, so it should not interfere with your WASD controls. Prone should be assigned to Space, so it can be easily pressed without taking your fingers off WASD at any moment. Meanwhile Flag Throw is assigned to LCtrl, but you need that function far less often. It would be much more suitable to assign Flag Throw to F.
Throw Grenade and Throw Weapon should be assigned to LShift and LCtrl, so they can be pressed with a pinky without taking other fingers off WASD and Space which are required for movement.